It was hot, it was sunny, and we were looking for a day of fun. 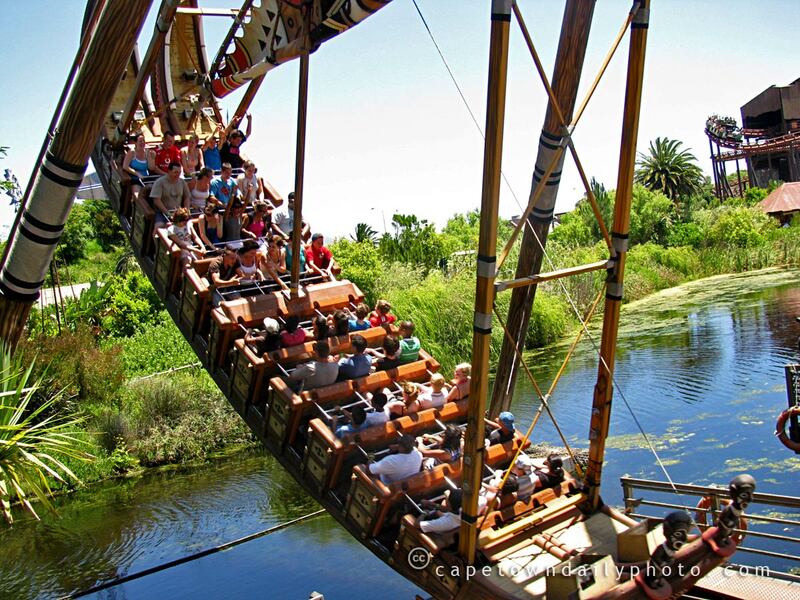 Ratanga Junction is Cape Town's own theme park, only 5 minutes from the city centre. We did have fun on the rides, though; especially on the Cobra, a huge, high-speed roller-coaster, and on the traditional log-floating-along-a-canal ride called Monkey Falls. Even though I'd taken my motion-sickness pills (a mandatory requirement for this kind of expedition) there was no way I was going to take a ride on the boat shown in the photo. The second row from the back hosts Kerry-Anne, our two visitors from Sydney, and a friend of ours kindly taking my place. Posted in General on Wednesday, 17 December, 2008 by Paul.